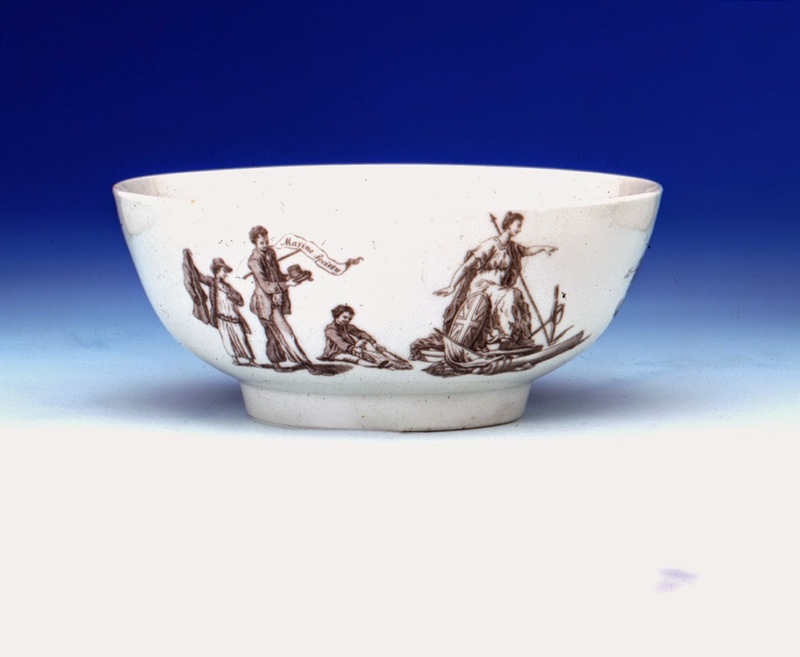 Bowl, Worcestershire Porcelain Factory, 1756-1760, National Maritime Museum. 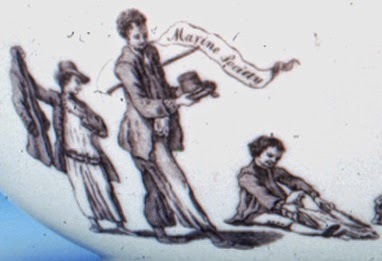 [The] three boys change into new seaman's clothes, one with a speech bubble: 'Marine Society'. The engraving appears in Jonas Hanway's 'Three letters on the subject of a Marine Society'. The Marine Society was founded in 1756 by the philanthropist Jonas Hanway and others. It provided funds to kit out poor boy volunteers for sea, thereby both recruiting them for the Navy and removing them from the streets. This means we get to see three sailors not in the clothes they have been working in for weeks or months, but a whole brand new set. On the far left is a lad without a shirt, wearing a pair of slops, a tall crowned round hat with short brim, and a jacket that ends just at the top of the leg. A black neckcloth appears to be fitted under his collar, but the angle of this photo makes it difficult to be certain. His mates both wear jackets of the same cut, and slops not unlike his. The fellow on the right can be seen pulling his slops up over his white breeches! Though dressed the same as the other two, the fellow in the center has a stick tucked under his arm. Hannah Willson, a Woman in "Sailor's Apparel"